Posted by Mollie Hamelund on February 3, 2019 in Hockey, Sports, Top Stories. 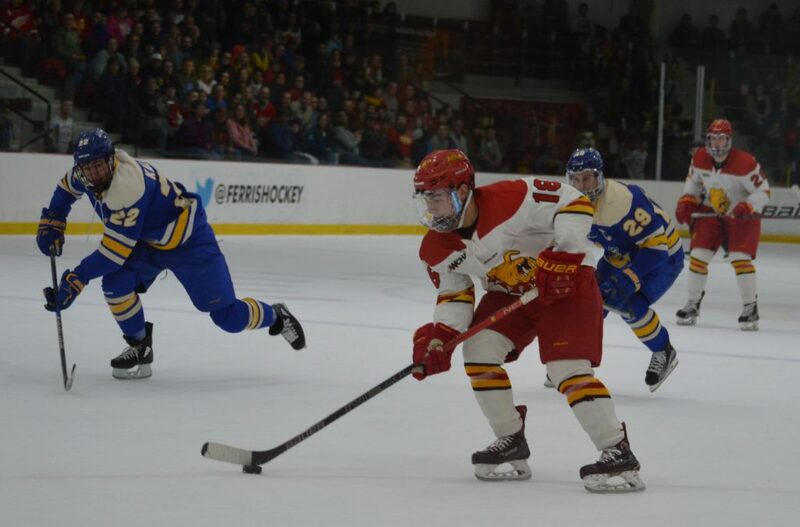 The Ferris hockey team is struggling this season and suffered a sweep at home against the Lake Superior State University (LSSU) Lakers this weekend. The losses brings their record to 7-19-1. The Bulldogs suffered a 6-3 loss to the Lakers Friday, Feb. 1. The Bulldogs held their heads up high going into the second game of the weekend series, but they fell 4-2 against the Lakers Saturday, Feb. 2. After last night’s loss with Ferris junior goaltender Justin Kapelmaster, who has one win for the Bulldogs this season, head coach Bob Daniels made the decision to start Ferris freshman goaltender Roni Salmenkangas. The Bulldogs were off to a good start, not allowing any goals in the first period and coming in quick during the second. Ferris freshman center Jake Transit was the first one to get on the board, with just three minutes into the second period. Transit got his fourth goal of the season with an assist by both sophomore left wing Liam MacDougall and freshman right wing Ethan Stewart. LSSU came back just three minutes later with a goal and didn’t stop there. The Bulldogs quickly fell behind by one and the score remained 2-1 for some time. It wasn’t until ten minutes into the second period that the Bulldogs started to see a comeback in the future. Ferris senior defenseman Jacob Hetz tied the game at two with the help of assists from junior forward Dominic Lutz and freshman defenseman Cooper Zech. But with less than one minute left to play in the second period, the Lakers scored another to leave the period with a 3-2 lead. The Bulldogs were left unable to score for the rest of the game, bringing their record to 7-20-1. The Lakers out-shot the Bulldogs 34-28, and Salmenkangas had 30 saves on the night. The Bulldogs are look to brighten their spirits and get off a two game losing streak at home Friday, Feb. 8, and Saturday, Feb. 9, against Bemidji State.